The next time you’re planning a home improvement project, it may be with a big, goofy VR headset. Today, Microsoft announced a plan to bring Hololens headwear to select Lowe’s locations. With it, customers will be able to see things like kitchen cabinets, countertops and appliances as part of a finished renovation — in VR. Microsoft also says Hololens will allow Lowe’s to “bring customers a new way to experience full-scale design and appliance options while maximizing precious floor space in the store.” The designs can be digitally rebuilt while customers are in the virtual environment, too; if a kitchen island is too large — or you’d like to swap between countertops to see which is best for your digital home — you can. Lowe’s and Microsoft are planning to use the kitchen as a starting point. Down the line, Microsoft imagines a time when we digitally furnish an entire home with VR before having the furniture delivered. Just remember not to sit down on that VR couch. There are plenty of apps that do similar things, but not in VR. 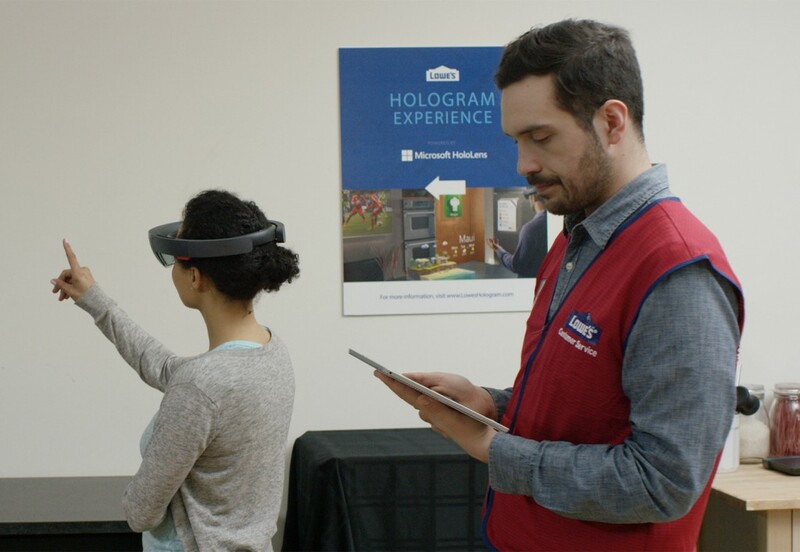 Microsoft may have just found another great niche for Hololens, and it’s not the first time Lowe’s has toyed with VR.